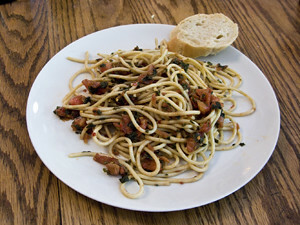 We first tried Linguine alla Cecca at the home of our dear friends Bruce and Diane in Buffalo, New York. 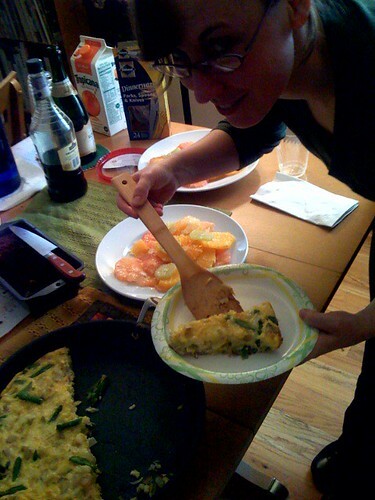 Diane prepared the dish which is a variation of Nora Ephron’s recipe from Heartburn. It is a delicious raw tomato sauce and is perfect for a summer meal. It also makes for great leftovers! Drop the tomatoes in boiling water for one minute. Let cool then peel, core, seed, and chop. Combine the tomatoes with the oil, pepper flakes, basil, garlic and salt. Cover and let the mixture stand at room temperature for a few hours. Remove garlic. 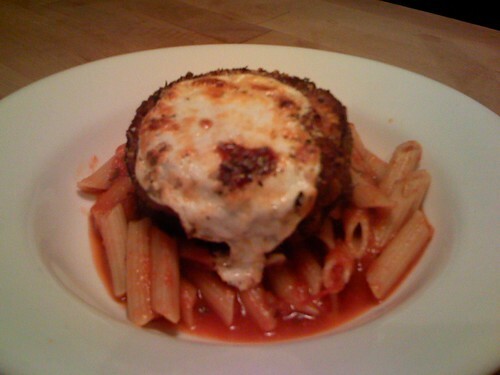 Serve immediately with grated Parmigiana Reggiano. This recipe is particularly special because it was made with the delicious tomato sauce we canned over Labor Day weekend. The tomato sauce recipe can be found here. Beat eggs together with milk in a shallow bowl. In a separate bowl toss bread-crumbs, dried herbs, and salt and pepper. Heat 1/4 inch oil over medium heat in a large frying pan, until hot but not smoking. Dip the eggplant wheels first in the egg mixture and then in the flour and fry in batches until brown on both sides, careful not to overload the pan. Place fried eggplant on paper towel lined plate to drain off excess oil. 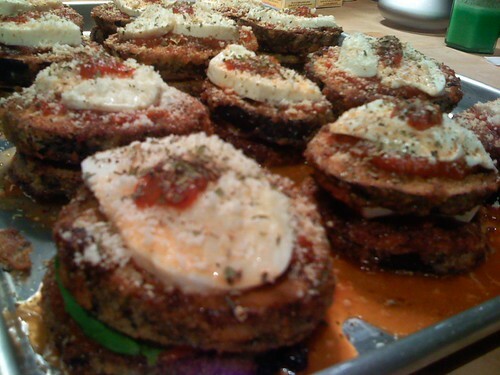 After all egg plant is fried place a tsp of tomato sauce on the baking sheet, followed by a piece of eggplant. On top of the eggplant place a tbsp tomato sauce, followed by one leaf of the fresh basil, one slice of mozzarella cheese and a sprinkle of parmesan cheese. Stack another piecer of eggplant on top followed by a tbsp of sauce, a piece of mozzarella cheese and a sprinkle of parmesan. Repeat with the remaining pairs of eggplant until all of the eggplant has been used. 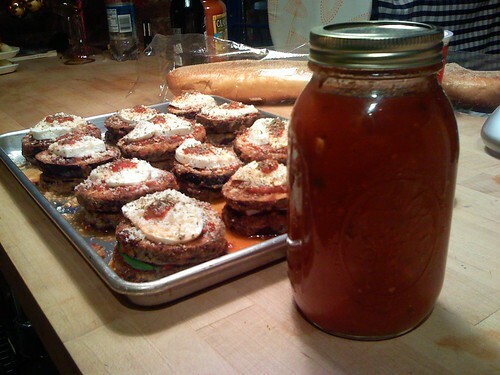 While the eggplant is in the oven boil the past and heat the remaining tomato sauce. Serve eggplant over pasta with tomato sauce. Preheat the oven to 400 degrees. In a medium bowl, whisk the eggs, Parmigiano, 1/2 tsp. salt, 1/8 tsp. pepper. Heat 2 Tbs. of the oil in a 12-inch ovenproof nonstick skillet over medium-high heat. Add the potato and cook, stirring occasionally, until browned on several sides, 6 to 7 minutes. Transfer to a bowl with a slotted spoon. Reduce the heat to medium. If the pan is dry, add the remaining 1 Tbs. oil. Add the onion and cook, stirring frequently, until it softens and begins to brown, 4 to 5 minutes. Stir in the asparagus, garlic, 1/4 tsp. salt and 1/8 tsp. pepper. Cook, stirring frequently, until the asparagus is bright green and crisp-tender, 3 to 4 minutes. Transfer the skillet to the oven and cook until the eggs have set completely and the top of the frittata is golden brown, 8 to 10 minutes. Let rest for 5 minutes. Transfer to a cutting board, cut into wedges, and serve. 1 cup chopped pecans or walnuts. 1. First, take the bourbon out of the cupboard and have a small snort for medicinal purposes. Now, preheat the oven to 300 degrees. Butter and flour an 8 1/2-by-4 1/2-inch loaf pan. Using a mixer, cream the butter and sugar until light and fluffy. With the mixer on low, add the beaten eggs, a little at a time. 2. Mix together the flour, baking powder, salt and nutmeg, and add to the batter. Then beat in the milk. Combine the molasses and baking soda and mix into the batter. To help prevent the raisins and pecans from sinking, dust them with flour, shaking off excess. Mix them, along with the bourbon, into the batter until combined. Transfer to the loaf pan and bake until a toothpick inserted into the center comes up clean, 1 3/4 to 2 hours. Makes 1 loaf. NOTE: Whiskey cake keeps practically forever, wrapped in aluminum foil, in your refrigerator. It gets better and better too, if you buck it up once in a while by using an eyedropper to add a little more whiskey. CLARE’S NOTE: Because I like the language of the recipe, I copied it verbatim. 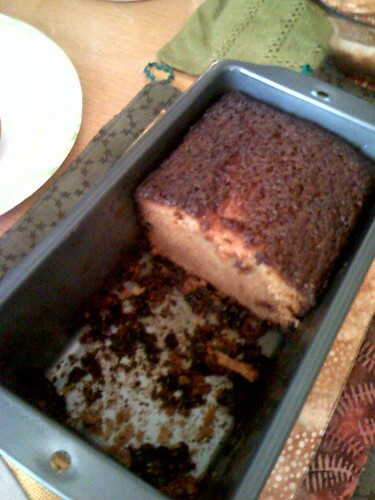 However, I decided to make this at the very last minute and made a few variations to the recipe – some by choice, some due to lack of ingredients. Instead of bourbon, I used rye; instead of molasses, I used honey; instead of regular sugar; I used demarara sugar; instead of raisins, I used dried black currants; I left out the nuts altogether. Preheat the oven to 350 degrees. Grease a 9” loaf pan. 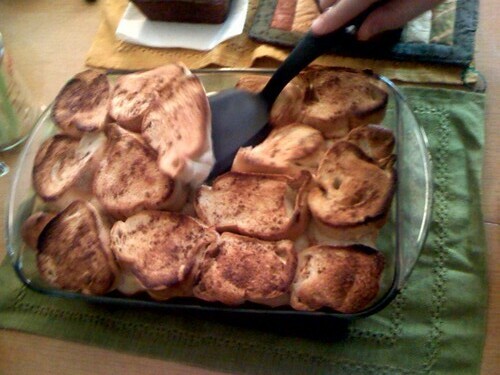 Using an electric mixer, cream together shortening and sugar until fluffy. Beat in eggs and vanilla. Add the bananas a little at a time, and beat them thoroughly into the batter. In a separate small bowl, mix the baking soda and water. Add a third of the flour to the batter and beat until blended in. Stir the baking soda mixture well and add half to the batter. Add half the remaining flour, followed by the other half of the baking soda, and finish with the last of the flour, blending the batter between each new addition. Pour the batter into the greased pan and bake for 1 hour or until a toothpick inserted in the center comes out clean. 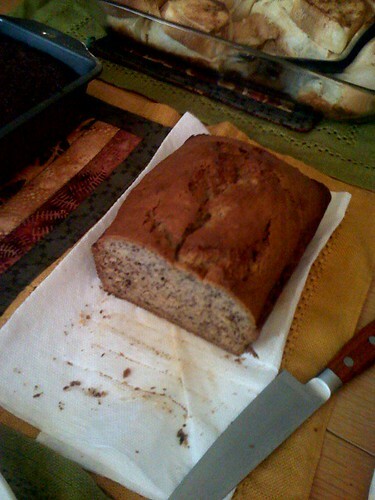 NOTE: This banana bread is also great with chocolate chips added! 1. Generously grease a 9×13-inch baking dish with butter. 2. Arrange bread in two tightly-packed layers in the pan. Fill in gaps with smaller pieces cut from the ends or spare slices. 3. Whisk milk, eggs, sugar, salt and booze and pour over the bread. Sprinkle with cinnamon and sugar. 4. Wrap tightly with plastic wrap and refrigerate overnight. The bread will absorb all of the milk custard while you sleep. 5. Bake at 425 for 30 minutes, or until puffed and golden. 6. Cut into generous squares and serve with maple syrup, fresh fruit, powdered sugar or all of the above. Yes, three chilies in one evening! 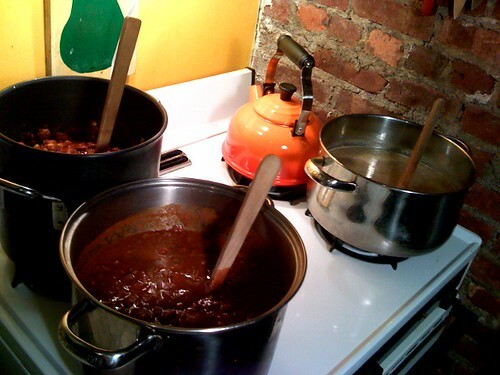 It is a fun way to feed a lot of people and who doesn’t love chili? We set up a toppings bar with sour cream, shredded cheese, chopped onion and hot sauce and people just served themselves. Add tomatoes, salt, and hot beef stock or water. Stir in masa harina. 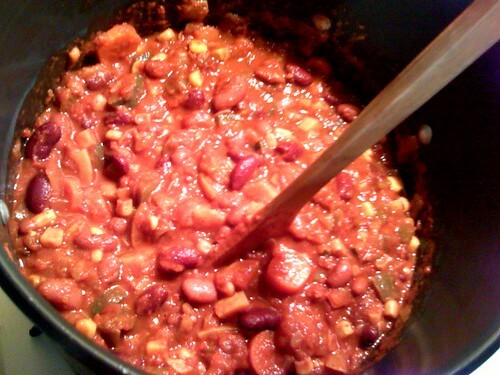 Bring to boil, cover, and let simmer, stirring frequently, about 3 hours. Place the oil in a large, heavy pot over medium heat. Add the onions, carrots, and bell pepper and cook about 8 minutes. Add the zucchini and squash; continue to cook until all the vegetables are tender, about 8 minutes more. Add remaining ingredients, except the garnishes; combine well. 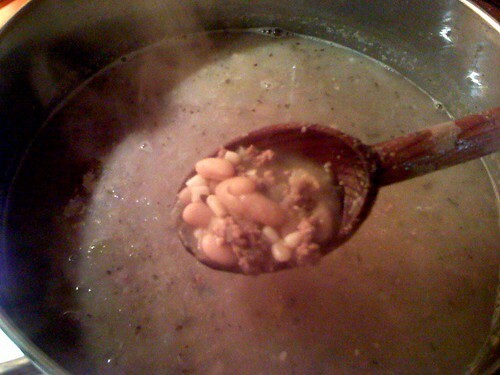 Bring to a boil, reduce heat; simmer gently for 1 hour, stirring occasionally. Serve in bowls with a dollop of sour cream and grated Cheddar, if desired. In a large pot over medium heat, combine the onion, garlic and ground turkey and saute for 10 minutes, or until turkey is well browned. 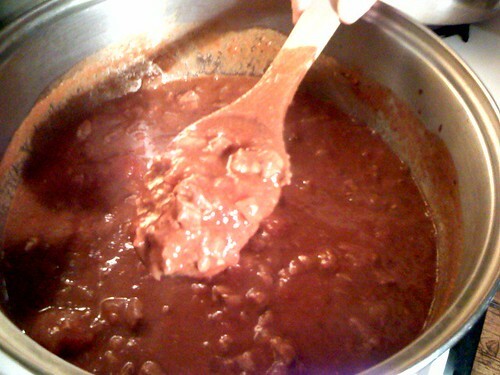 Add the chile peppers, cumin, oregano, cinnamon, cayenne pepper and black pepper to taste and saute for 5 more minutes. Put a handful of tortilla chips in the bottom of bowl and pour a serving over the tortilla chips. Garnish with cheese and sour cream.